The Night Circus is a magical book that will have your group talking into the night! Without a doubt, it will be like no other book you’ve read before! If you want to get creative, there are so many fun things you can do to make your guests feel as if they have entered: Le Cirque des Rêves. Invitations: Most book clubs are pretty informal, but if you want to make this meeting a little more enticing, try coming up with a unique, circus themed invitation. Check out these ones from Zazzle. Not only are they circus-themed, but they are black, white and red – just like everything in the book! 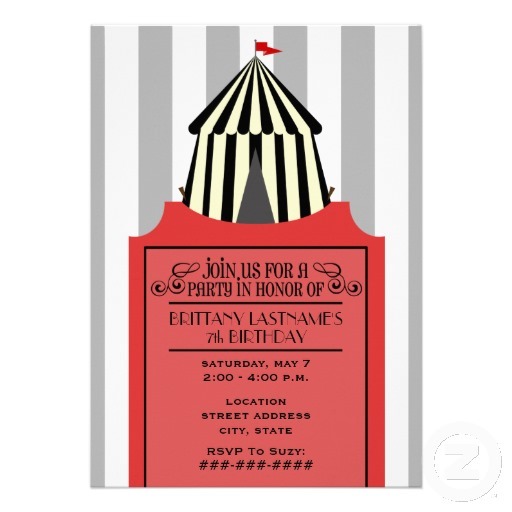 Be sure to invite your guests to wear Night Circus inspired clothing: black, white, and of, course red! As the Rêveurs, they should definitely wear a lovely red scarf! This outfit is from Restyle, and it may be a little over the top. The gals in my book club would probably opt for something a little more casual, but we all love scarves! 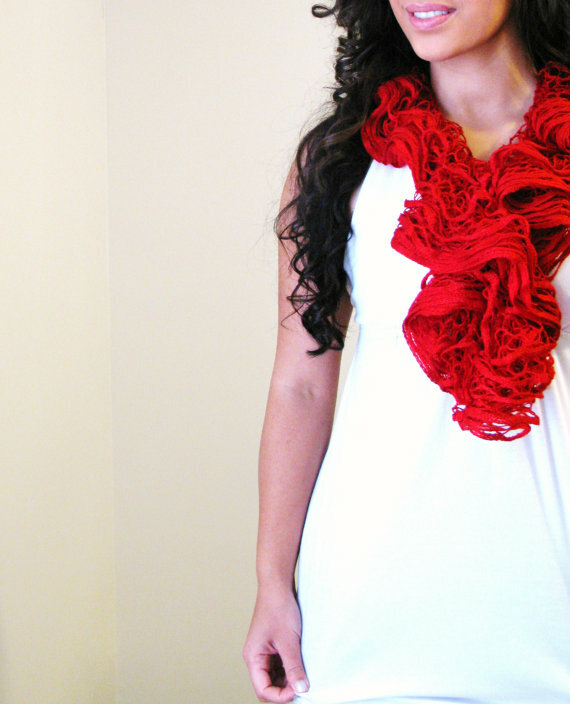 This ruffled one from Etsy’s Maha Maha creations has a fun, circus-vibe, don’t you think? Decorations: Without a doubt, the decorations for your Night Circus party could be out of this world. However, if you have a real life, and can’t spend a fortune on decorations, here are a few ideas! There were so many interesting tents at the circus, you could simply try to re-create one of them. One of my favorite tents was “The Wishing Tree.” Check out this tree from Kaboodle. Wouldn’t it be fun to let your guests make a wish and light a candle, just like in the book? One of the tents was papered with playing cards. 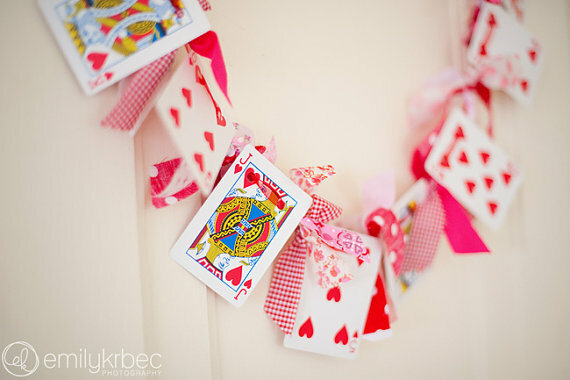 It would be simple and easy to create a fun, playing-card garland to drape on the food table or across your fireplace. This one came from Etsy’s Country Chiq. One of the most memorable tents was the Ice Garden. 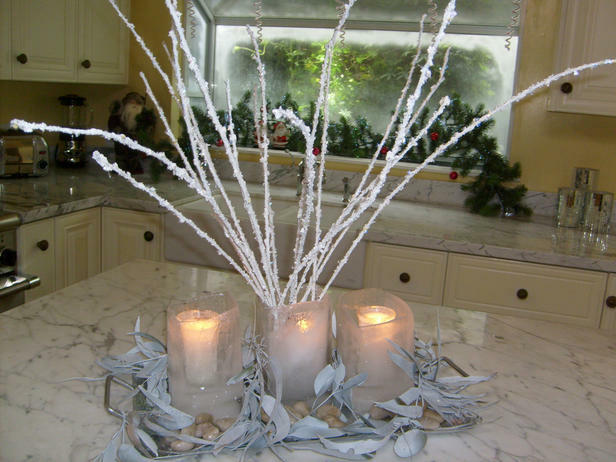 Beautiful decorations could be made from clear vases, crystal-like accents, or perhaps these actual ice vases from HGTV. 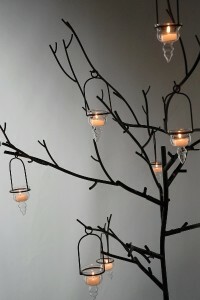 Other decorating ideas that would fit with the book are: mirrors, candles, bird cages, feathers, etc. Food: There are so many yummy foods that the characters enjoyed at the circus: caramel corn, caramel apples, cinnamon twists, mulled cider and of course, the gourmet midnight dinners were feasts accompanied by decadent cakes and chocolate covered strawberries! However, my favorite food at the carnival were the chocolate mice. According to author, Erin Morgenstern, the mice were inspired by these ones from L.A. Burdick. Aren’t they adorable? 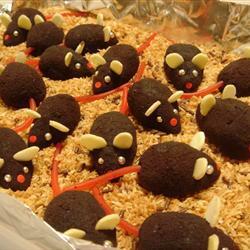 There are numerous chocolate mice recipes online. Try this one from All Recipes. 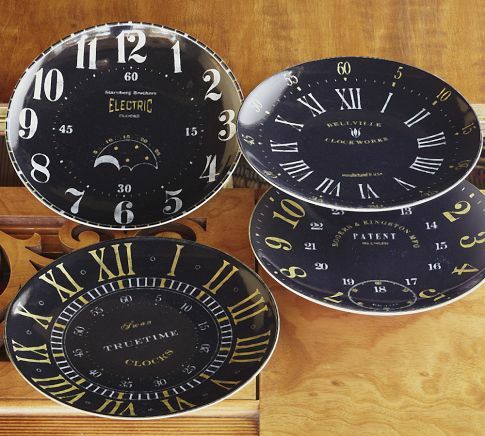 Wouldn’t it be fun to let your guests enjoy yummy food on these amazing plates from Pottery Barn? Perhaps you can find (or make) something similar! The clock at the circus is an important part of the story, and time is something that affects the characters dramatically. These would be perfect! 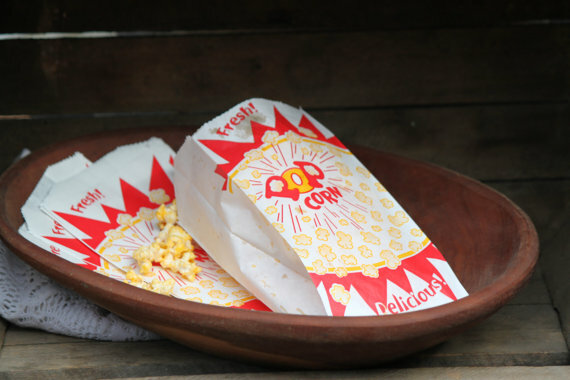 Perhaps you want to add more circus flair by picking up some vintage popcorn bags from Etsy shop Spiral Sage. Activity: Many of the characters relied on the fortune telling abilities of Isobel, who discovered the secrets of others while keeping a very big secret about herself! Set up a fun fortune teller’s table. Get an “8-Ball” toy, buy a pack of Tarot Cards, spread out some tea-leaves. See what kind of fun you and your friends can have telling the future! 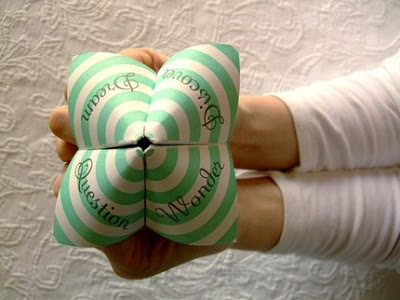 Sycamore Street Press has a lovely origami fortune teller party favor! Remember these from when you were a kid? Discussion: Well, we all hope that our book club gatherings end up with at least a little bit of discussion about the book, right? Author, Erin Morgenstern, recommends the questions provided from the publisher at Random House. Favors: You probably couldn’t help going a bit overboard for this book club gathering, so why not send your guests off with a small token of your time together? 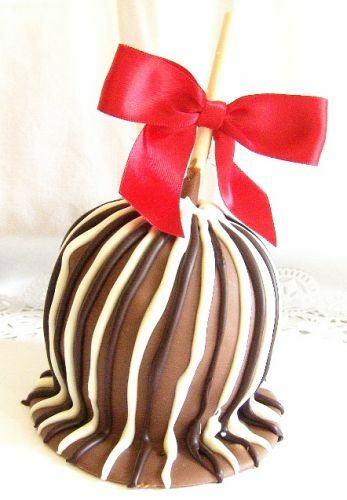 I think they would all love to settle in with a gooey caramel apple and your next book selection, don’t you? These ones are from Matisse Chocolatier, but you can try your hand at making your own! 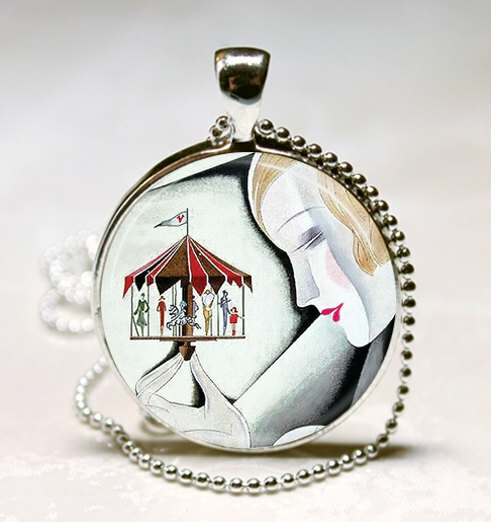 Missing Pieces Studio makes beautiful charms like this circus inspired beauty! I hope your Night Circus book club gathering is as magical as the book. It just might last until midnight! 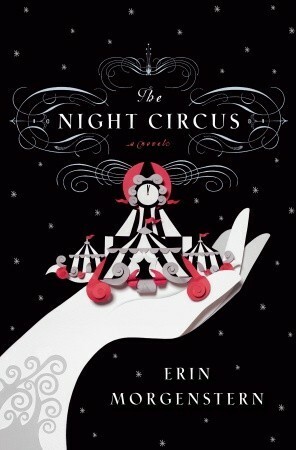 Thanks for sharing your information about book group meeting ideas for Night Circus. I’m looking for food ideas, but will share the “invitation” to the gathering I just sent out. I made b/w postcards with “The Circus is Coming” (black background, white letters) on one side, and the date, time and address of the meeting site on the other (white with black letters). I sent them anonymously to all the book group members, in envelopes addressed in red ink. The meeting isn’t at my house, so people will eventually wonder who sent them. 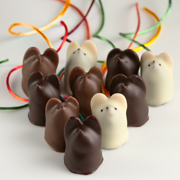 I think I’ll use Mounds Bars with almond sliver ears to make chocolate mice (of course I’M bringing chocolate). Maybe I’ll think of some “real” food that fits as well. I like your site, and I’ll probably be back to see what other ideas I can get.